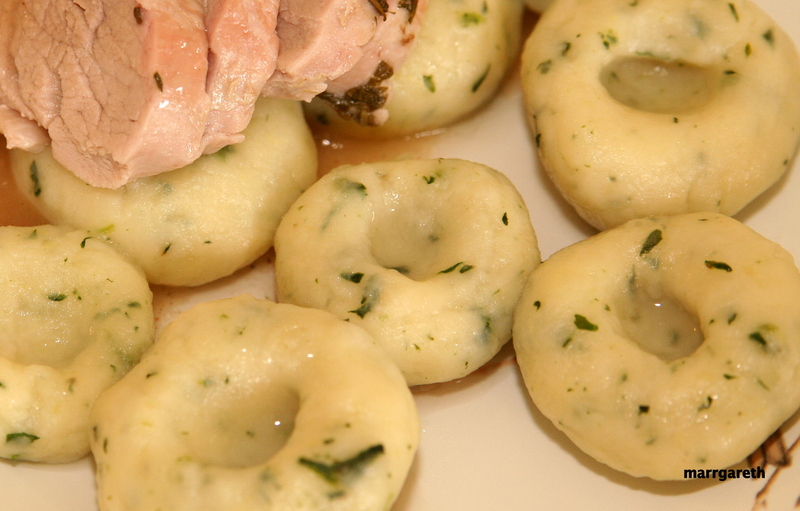 I think every child loves potato dumplings. This version of dumplings is a very good solution for children who do not want to eat vegetables. The recipe below does not contain eggs or milk so this dish is also a very good option for kids with food allergies such as milk allergy and egg allergy. These dumplings can be served with meat or as a separate dish. Cook peeled potatoes in boiling salted water until tender. Drain thoroughly, then mash them. You can even cook potatoes a day before. Cool the potatoes down enough so that they do not burn your hand anymore. 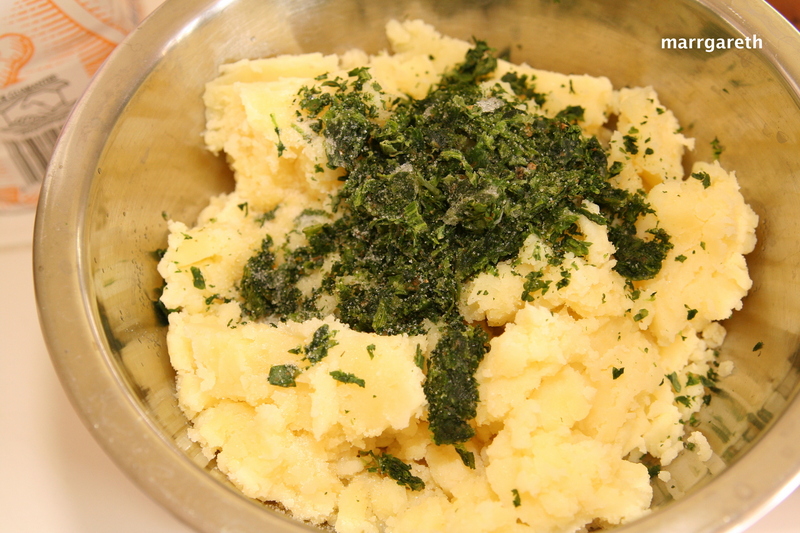 Add salt to taste, then pour the oil and add spinach, mix well. The most important thing to know about these dumplings is that they have to be cooked immediately after they are formed. Before you start working on dumplings set a big pot filled halfway with water on the stove. When you finish forming the dumplings the water will already be boiling. 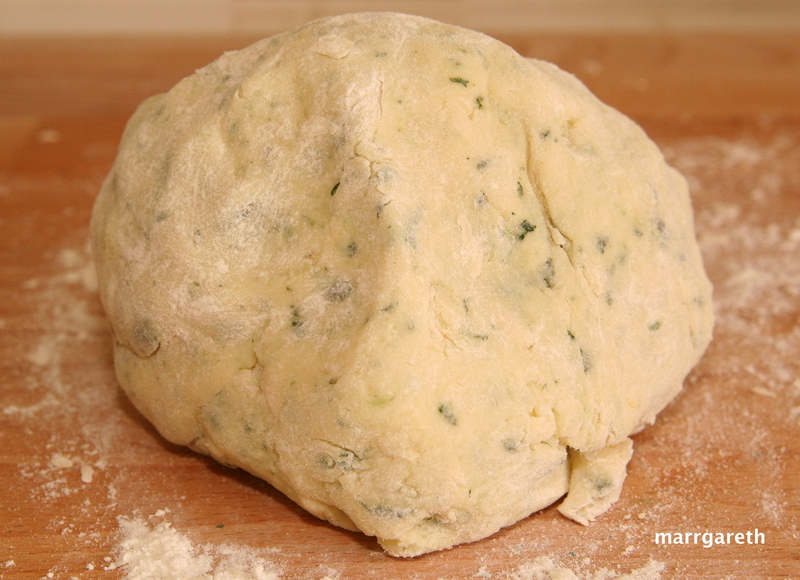 Gradually add the flour to the mashed potatoes and knead the dough. Add enough flour to make a smooth, soft, not sticky, dough. If you used all remaining flour and your dough is still sticky, add some more flour. 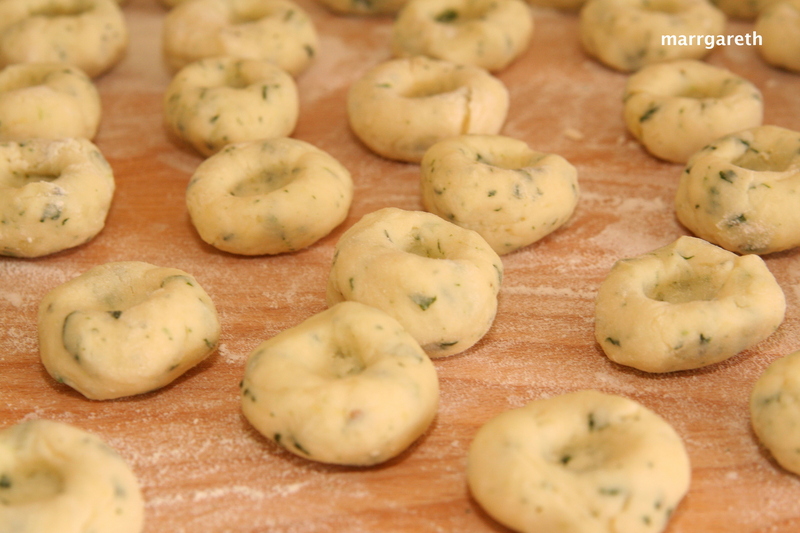 It is hard to tell how much flour you will need, because every kind of potatoes is different. The best what you can do is to add flour gradually. Roll the dough into a shape of balls about the size of walnuts and place apart on a slightly floured pastry board or a regular board. Make a small cavity/indentation with your finger on each ball as on the picture. Now, when the water is boiling add 2 tbsp. of salt. 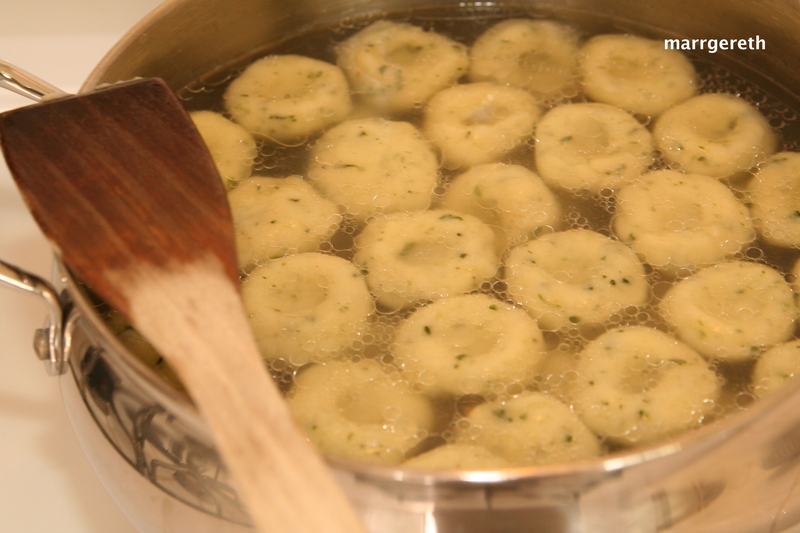 Throw the dumplings in into the salted boiling water stirring occasionally with a wooden spoon. Stirring is important, so that the dumplings will not stick to the bottom of the pot. When the dumplings start to float to the surface boil them 1 – 2 more minutes. Do not cook them for more than 2 minutes. Using a slotted spoon collect the gnocchi. Do not over cook them.